You're probably already aware of the huge waste produced during the holidays. If you Google "Holiday waste", you'll find hundreds of links to tips about reducing and recycling. I wanted to share my choice for gift wrapping this year. It looks a bit familiar to yesterday's post because I'm enthralled with burlap, as you know, but I have another love: brown paper. I try to put any paper bag that comes into my life to good use. Because I primarily use cloth totes for the market, these are getting scarcer. Brown craft paper, also known as postal paper, works as a substitute with the same aesthetic appeal. I've often used it for wrapping paper, but am trying to minimize that and opted for easy cloth gift sacks instead. This year, I'm using the brown paper sparingly for gift tags and look what I've come up with... I'm so excited with this technique that I had to show you right away! I love these gift tags so much, I might even give little stacks of them as gifts, themselves! - Use printer paper as a template, and cut out three sheets from a paper bag or craft paper roll. - Iron brown paper until smooth and flat (have you noticed how I use my iron as much as possible?). -Print onto your brown paper and cut to size. I'm not sure how I will use the pear paper, but I couldn't resist it. A little bit here and there will go a long way. 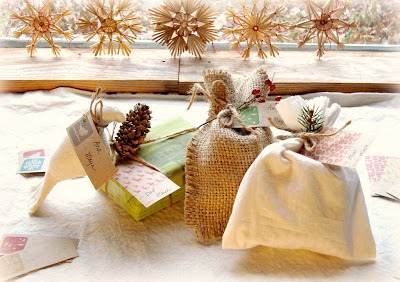 I attached tags to my gifts with garden twine (jute from the hardware store) . If you've bought any of my coffee sack buckets, this whole concept will look very familiar. My product tags are created exactly this way, but without the pretty graphics. - Fold a long rectangle of muslin in half. -Cut the top with pinking sheers and sew up the sides. -Turn so raw edges are in the interior. -Pop in your gift and tie with ribbon or twine. -Cut two identical rectangles of burlap (from recycled coffee sacks!) following the weave. -Sew around three sides leaving a 3/4 inch seam allowance. -Pull out strands of the weave on each side to create a neat, but frayed edge. If you must use wrapping paper, consider trying recycled newspaper. You can always use the funnies, but I prefer to give newspaper wrap a unique twist. Give it a wash of diluted acrylic craft paint and let it dry before wrapping the gift. Incorporating little bits from nature is always a beautiful and green choice. 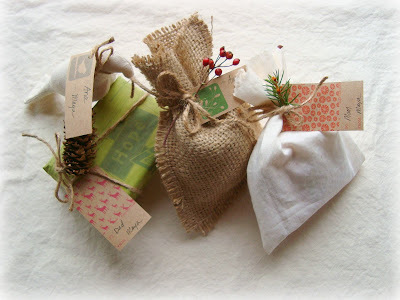 There are so many wonderful alternatives for eco gift wrap! This is what I'll be doing for the holidays... I'd love to hear some of your ideas! one thing I love to do is to wrap gifts in my son's paintings, he loves to paint & draw & instead of throwing some of them out (we can't keep them all) I use them for instead of wrapping paper. 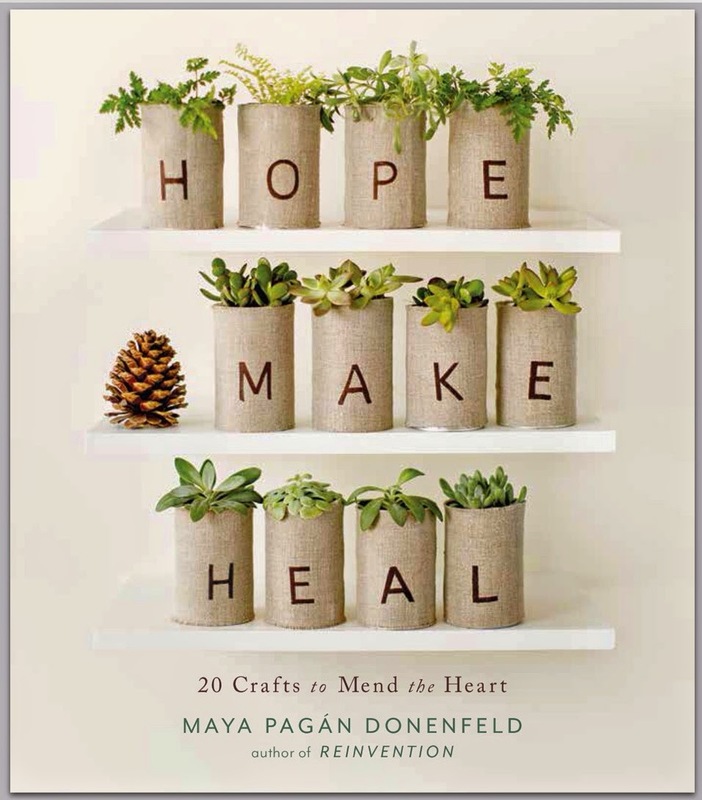 Oh Maya, these wrapping are soooo pretty & I'm so with you with the holiday waste, as well as for the love of brown paper ! I have few presents to wrap this year, I won't be using fancy paper, but kraft paper, that I will re-use in different kind of ways. All the other gifts will be wrapped in fabrics. These are seriously pretty packaging! I love it's natural, organic style. Thanks for the inspiration! I have been making scrap fabric ornaments as gifts, they are on my blog if you want a peek. I have been drawing on pieces of natural linen/cotton blend fabric to make the ornaments into unique gifts. I really love your tags and gift wrapping! So beautiful! Brown paper and card stock, burlap (need to find some! ), twine and jute, that’s really all you need to make beautiful gifts! I believe the wrapping of presents is at least as important as what is inside! One of my favorite eco wrappings is to use thrift store linens or scarves as wrapping paper. I love the gift within a gift concept. I use cloth ribbon , fabric strips or left over bits of wool. All biodegradable or reusable long after the holidays. I never thought of printing on brown paper or bags - that's awesome. And what lovely graphics! Wow I love the idea - I sometimes give my boys crayons and markers to bags but I LOVE the pears. Thanks! I love brown paper as wrapping and tags! 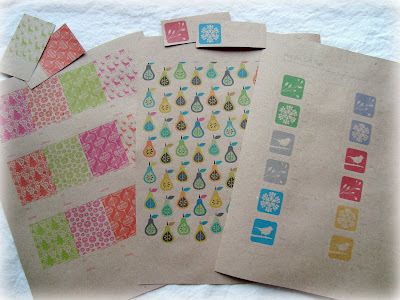 I also love that pear paper...it would look great as wrapping paper! i found some wonderful organic cotton bags which i have printed on and will be using as gift bags. when the gift has been "unwrapped" the bag can be used for transporting groceries or as a really fabulous bag! these are so nice. I'm going to make some today! Thanks for the fantastic ideas! I love all of them...and they're so pretty too. I try to reuse any gift bags, wrapping paper, boxes that I've been given in the past. I have not bought any those items this year and it feels really good too, knowing that I'm using from my current stash. I'll most certainly be sewing up a few fabric gift bags as well. They are so simple and the options are endless! Thanks so much for featuring my pear paper. I am a huge fan of your site and was thrilled to see it listed here! I love your ideas and creativity! Thanks again! These are great! Now if I wasn't so pressed for time... lol! Those gift tags are so beautiful. Thanks for sharing your tips! I've been concerned about this as well, and I'm thinking of investing in nice boxes with lids, decorating them, and then using them year after year with no wrapping paper at all. Didn't get around to pulling it off this year, though. What I have been making is drawstring bags in the hope that the recipient will either find a use for it - or reuse it as a gift bag in the future. I was hoping to post about it this weekend so will leave another comment here if i do. En quelques mots seulement : BRAVO ! Des superbes créations, toujours originales et plienes de belles histoires. MERCI. 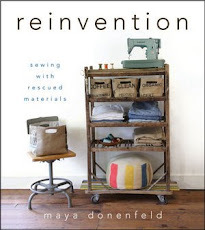 maya made est parmis mes blog favorits et je trouve dans tes creations beaucoup d'inspiartion. Joyeux Noël et bonnes Fêtes en famille. Thank you, thank you for the link to those gift tag templates. I love the pears! I actually used the one from paperseed last year when wrapping up our annual chocolate babka delivery to the neighbors, but I never thought to print them on brown paper. Love that! You are brilliant. Your gift bags are DARLING, I love them! I'm also in awe of your tags. SO cute and I love the ones with Lolly's awesome pear design! So pretty! Thanks for the reminder, I always "think " this but forget to do it. By the way (silly question) how do you tie the pine cones on to your presents, any special way? Do they need to have a stem? Thanks for all of your great ideas and enthusiasm! Betz- regarding the pine cones: I tie the twine around the lower portion of the cone and pull it taut. It automatically gets hidden and secure within the inner workings of the cone. I think it works best with jute because the colors blend nicely. Great question! If you don't have any brown paper to use you could coffee dye some white paper you want to recycle. I had some of the same thoughts this year! I love the cloth bags and the idea of making cloth tags. Just linked you up with this post and am going to be "home" this coming weekend. May have time to make it out your way...plans still up in the air. Email me or I will you but now have to run!! Great projects! Lovely baggies! Thanks a lot for sharing! Those gift bags are so adorable, and I love the printed brown paper! Almost everyone in my family saves gift bags, and reuses them the next year. It is funny to get a gift from grandma in the bag that you gave to her the year before.